Jazeman will join an all-Malaysian line up to contest the Gulf 12 Hours at Yas Marina Circuit in Abu Dhabi later this month. 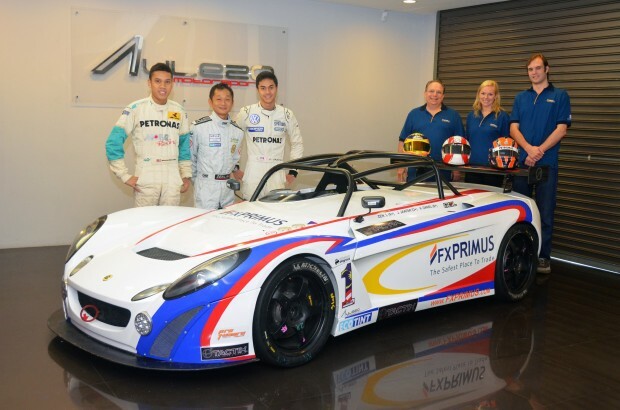 Driving for the FX Primus Aylezo Racing Team in a Lotus 2-Eleven, Jazeman will be experiencing his first sportscar endurance event when he lines up for the start of the race. With team mates Hiqmar Danial and Zen Low sharing the driving duties, the three young Malaysians will be flying the flag for their country at this inaugural Abu Dhabi race. Jazeman says of taking on an endurance challenge, “I’m very excited to be taking part in my first international endurance event and it is particularly special to be representing my home country with two of my fellow countrymen. As it is the traditional ‘off season’ of European motorsport it is an opportunity for me to gain track time, keep myself race fit and experience a different style of racing. “I haven’t driven this car yet, but I don’t anticipate that it will be too difficult to adapt to it, as it is very much a racing car at its core, there’s just more bodywork around it. I’m looking forward to driving at the Yas Marina circuit, as it is one of the tracks on the Formula One calendar and I’ve been there as a spectator, but never driven or raced on it. “I think the biggest challenge for me will be racing with a large field of cars. I think there will be around 48 in total, divided into different classes. There will be some faster cars in other categories which will be overtaking us throughout the 12 hours, so I’ll have to get used to looking in my mirrors for these cars and make sure I run cleanly with so many other cars on track. “Racing at the Gulf 12 Hours will be a great experience, as it will not only need me to be race fit right from the start of the year, but I will also need to have the stamina to do around three hours of racing over the course of the race, in addition to the practice and qualifying sessions ahead of the event. We’ll also be racing from daylight to twilight and under the bright lights which are used for the evening F1 race and this will be all new to me as well, adding to the challenge. Nineteen-year-old Jazeman is currently competing in European single-seater racing, with a highly successful season of racing in 2011, combining contesting the British F3 International Series with the FIA F3 International Trophy. Finishing sixth in British F3 and seventh in the F3 International Trophy, Jazeman has proven his potential and is planning to continue his career in European racing in 2012.